Rhombencephalosynapsis is a rare malformation characterized by fused cerebellar hemispheres, fused dentate nuclei, and vermian agenesis. It has varied clinical presentations and is usually diagnosed in childhood or infancy. However, uncommonly, it may be detected in adult patients. 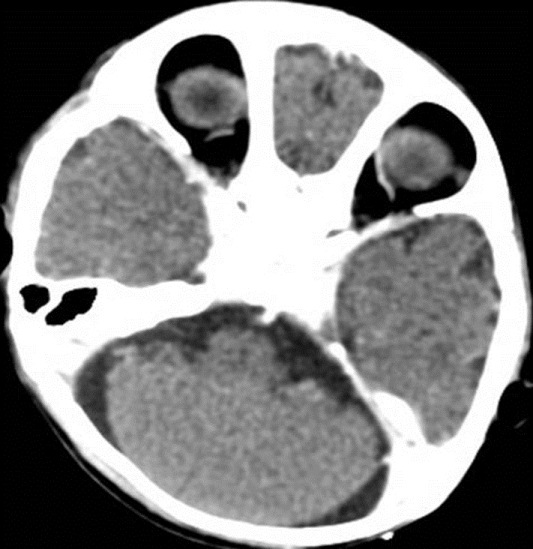 Classic features are evident on magnetic resonance imaging (MRI); however, computed tomography (CT) may be able to suggest the diagnosis. A nine-month-old female child presented with global developmental delay. There was no history suggestive of birth asphyxia. She had a normal full-term vaginal delivery. On examination, she had a developmental age of 4-5 months and a development quotient of 66%. 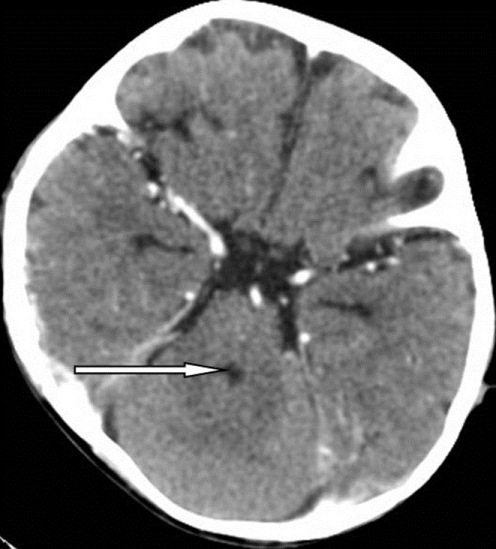 She presented with a single episode of a partial seizure for which CT of the head was done. On contrast enhanced computed tomography (CECT) of the brain, there was absence of vermis, with fused cerebellar hemispheres and a diamond-shaped fourth ventricle suggestive of rhombencephalosynapsis [Figure 1] and [Figure 2]. There was also evidence of turricephaly or tower skull, best depicted on volume-rendered images [Figure 3]. No other structural defects were seen in the brain. The MRI of the patient was not done due to financial constraints, but the CT features in this case were characteristic of rhombencephalosynapsis. 1. Utsonomiya H, Takano K, Ogasawara T, Hashimoto T, Fukushima T, Okazaki M. Rhombencephalosynapsis: Cerebellar Embryogenesis. AJNR Am J Neuroradiol 1998;19:547-9. 2. Obersteiner H. Ein Kleinhirn ohne Wurm. Arb Neurol Inst (Wien) 1914;21:124-36. 3. Mendonca JL, Natal MR, Viana SL, Coimbra PP, Viana MA, Matsumine M. Rhombencephalosynapsis: CT and MRI findings. Neurol India 2004;52:118-20. 4. Barkovich, AJ. 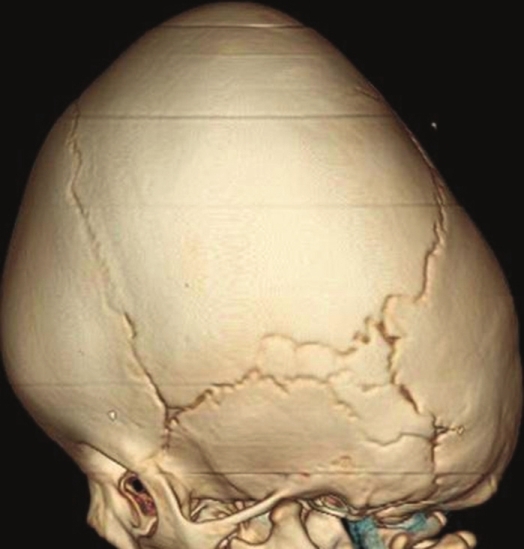 Congenital malformations of the brain and skull. In: Barkovich, AJ, editor. Pediatric neuroimaging. 3 rd ed. Philadelphia: Lippincott Williams and Wilkins; 2000. p. 251-382. 5. Toelle SP, Yalcinkaya C, Kocer N, Deonna T, Overweg-Plandsoen WC, Bast T, et al. Rhombencephalosynapsis: Clinical Findings and Neuroimaging in 9 Children. Neuropediatrics 2002;33:209-14.